Sunday is always a laid back time . The best time for family unions, rest and a new week insight. Most African family Sunday lunches consists a rice staple dish paired with a sauce. Whether you are staying in at home or going out for lunch, we have attached a remarkable dish that will wet your appetite and change the Sunday Lunch menu!! 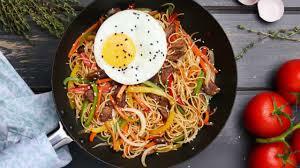 DIRECTION- Bring water to a boil, add pinch of salt and cook spaghetti for 7-8 minutes, drain and set aside.- Pour oil in a wok over medium heat then add the beef and stir-fry for 5 minutes.- Add garlic, onions, beef seasoning, stir and let cook for a minute.- Add carrot, green bell pepper, yellow bell pepper, red bell pepper, chopped chilli and stir.- Add spaghetti, toss to mix well.- Top with sunny-side up and sprinkle with black and white sesame seeds.- Ready to Serve.